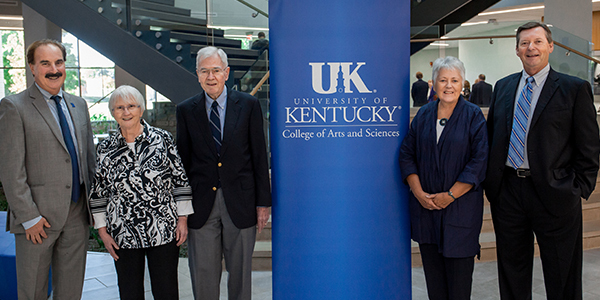 The College of Arts & Sciences inducted four new members into its Hall of Fame on Oct. 7, 2016, with a ceremony in the Don & Cathy Jacobs Science Building. The inductees included Kip Cornett, General Studies ’77, Dr. Sally Mason, B.A. Zoology ’72, Honorary Doctorate ’12, Dr. Robert M. Ireland, J.D., Ph.D., Department of History, and Judith A. Lesnaw, Department of Biology. Make plans to join us for the Arts & Sciences Hall of Fame Induction Ceremony & Reception on Friday, Oct. 6, 2017. This year’s alumni inductees are Charlie Grizzle, English B.A. ’73, Martha Rolingson, Anthropology M.A. ’60, and Tom Spalding, Geological Sciences B.S. ’80, M.S. ’82. This year’s faculty inductees are Karl B. Raitz, Department of Geography, and Daniel R. Reedy, Department of Hispanic Studies. Visit www.as.uky.edu/halloffame for more information.